The Rock Hall and the Rock Hall boutique will be open for visitors and shopping until 9:00PM. Purchase discounted admission tickets here. *Providence House protects at-risk children and supports families through crisis, strengthening communities to end child abuse and neglect. Its vision is to ensure that children everywhere are raised in safe, loving families free from abuse and neglect. Believe in CLE and Inner Bliss Yoga Studio are proud to support this organization and its passion, energy, resilience, devotion and determination to end child abuse and neglect. Please bring your donations to our event! Thank you! 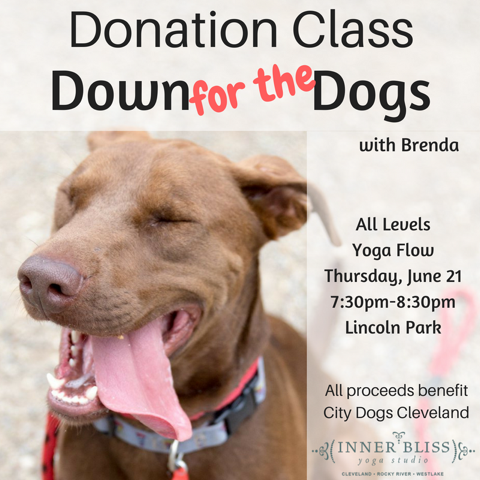 We are excited to welcome yoga teachers from all over CLE as Assistants at our event who will offer hands on assists throughout the practice. Students who are not be interested in being assisted can indicate so with a red heart sticker placed on the top right hand corner of their mat. We will be distributing the stickers the night of the event. Students can get a sticker at registration or from any Assistant before or during the practice. While we will offer this option, it is ultimately each student’s responsibility to let the Assistants know that the student is not interested in being assisted. Climb an exhilarating and powerful climb at Rise Nation CLE and then float over to Inner Bliss for a slow flow to loosen and chill. Climb from 11:15am-11:45am and walk over to Inner Bliss to stretch and breathe from 12:00pm-12:30pm. Cost is $25.00 per student. This experience will leave you blissed out! Climb from 11:15 - 11:45 and walk over to Inner Bliss to stretch and breathe from 12:00- 12:30. Friday, August 17 at 6pm RR with Daneen - $20.00. Join Ann Richards on June 3rd from 10-11am at Alley Cat Oyster Bar located at 1056 Old River Road in Cleveland, OH 44113. $35.00 Ann will lead you in an All Levels Flow Yoga class on the rooftop of Alley Cat followed by brunch and a mimosa after the practice. Come breathe and connect! Grab your mat and join us down Main Street for a FREE all level flow class taught by Inner Bliss Yoga Studio's Lanie McManus. First 100 participants will receive a goodie bag from Athleta and all will be entered to win store gift cards during the event! Climb an exhilarating and powerful climb at Rise Nation and then float over to Inner Bliss for a slow flow to loosen and chill. This experience will leave you blissed out! Price is $20 for both a 30 minute climb at Rise Nation CLE and a 30 minute yoga flow at Inner Bliss Yoga Studio in Downtown, Cleveland. Experience yoga on the gridiron with Inner Bliss at FirstEnergy Stadium on June 22nd at 6:30pm. The yoga practice will take place on the field at FirstEnergy Stadium, home of The Cleveland Browns! Please also enjoy a complimentary game ticket of your choice to cheer on your Cleveland Browns against the NY Jets on Thursday, September 20th or the LA Chargers on Sunday, October 14th. Tickets will be distributed via email 48 hours prior to the game. Join Katie Brown on Saturday June 9th for an All Levels Flow class from 11:00 - 12:00 at Sibling Revelry Brewery located at 29305 Clemens Rd, Westlake, OH 44145. Cost $20.00 which includes the practice and a pint! Cost $20.00 which includes the practice and a pint! Lakewood Community Services Center serves over 7,000 people in Westlake, Rocky River, and Lakewood. The only hygiene products they receive are tooth brushes and toothpaste. If you could find it in your heart to supply even just one of the above items and bring it with you to Inner Bliss before Tammy's class on June 9, it would be appreciated by some folks in need at the moment. In addition to the items donated by students, all fees collected for this class will go directly to Lakewood Community Services Center. Lakewood Urgent Care will be equally matching Inner Bliss donations. Join Ann Richards on June 3rd from 9-10 am at Alley Cat Oyster Bar located at 1056 Old River Road in Cleveland, OH 44113. 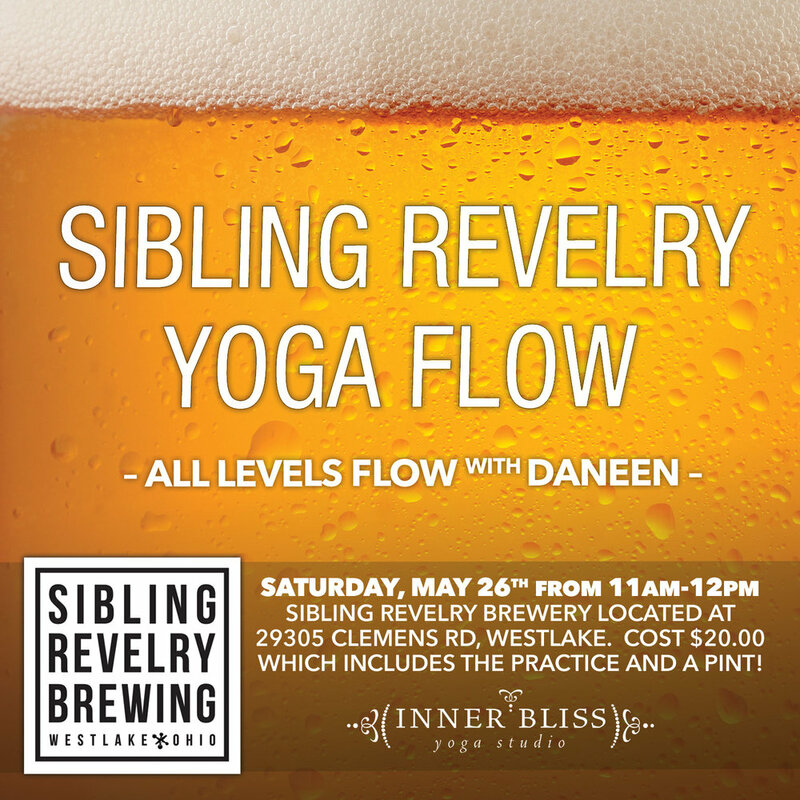 Join Daneen Farrall on Saturday May 26th for an All Levels Flow class from 11:00 - 12:00 at Sibling Revelry Brewery located at 29305 Clemens Rd, Westlake, OH 44145.